She is interested in integrating drawing more fully and effectively into the work that instructors and students do in those labs. The rest of this post provides context on what we’re aiming for, as well as a lot of resources I’m sharing with her. Her motivation stems, at least in part, from noticing that photographing specimens appears to be the most common way students interact with specimens in these labs. And yet, based on low exam scores, students aren’t getting much out of taking photos. And so, we’ve been talking about how to utilize drawing as an active learning tool, as well as a self- and summative assessment strategy. Considerations include how to introduce drawing to TAs and students, and how to integrate it in myriad forms (phylogenetic trees, graphs, food web diagrams, specimen sketches, etc.) throughout lab activities, homework assignments, quizzes and exams. We’ll be doing a TA training session before the semester begins, to ensure the TAs have basic familiarity and comfort in sketching and to troubleshoot facilitating it with their students. As we planned all this, I realized that one thing I take for granted is my capacity to articulate how and why to utilize drawing in these ways. And so, I offered to write up some text which she could copy or modify and distribute to TAs and students. What follows is what I’ve come up with. Feel free to utilize it, and if you do, please do let me know how it goes, if and how you adapted it, etc. You are welcome to reproduce this note and images therein in your syllabus or course website, so long as I created the images. Reproduction of images credited to other artists/authors must be arranged with them. Please provide attribution, even if you revise the text based on your own interpretation of the materials cited herein. And again, I’d love to hear what you come up with. Humans think in images. Our brains actually understand images faster, and remember images longer, than words . Archaeological records indicate that drawing was the first visual representation method . And history demonstrates that drawing has been an integral part of learning for centuries. Even better, we know that drawing is an incredibly powerful tool for learning scientifically , and for helping us assess our own knowledge  and misconceptions about material we’re studying . We also know that keeping notes by hand  (even doodling! ) results in better retention of the information, higher intellectual engagement in the material, and therefore, better grades. Drawing (even without training) can: aid learning & memorization , help clarify what you know , enhance research methodology , improve your experience with and performance on assessments , enhance your visual thinking skills , enhance creativity and problem solving , and enhance science communication efforts . There is even evidence that collaboration between scientists and artists  may result in better science . This is all pretty important, considering that a lot of the things that we do and use in our daily lives depend upon scientific knowledge. Whether you’re sending a text, taking a photo, eating an apple in December, or using a hand sanitizer, you’re tapping into the wealth of technology and information that has been derived through scientific study and experimentation. Whether you pursue a career in science or just want to be sure your decisions are informed by facts, thinking scientifically and understanding science-related information has great value for you and society. So, it is also important that you learn some of the skills associated with this way of thinking. And drawing is a significant one. For our purposes in this course, you might make a highly-polished illustration of a leaf, sketch out a few circles indicating locations at a research site, diagram genetic relationships in a phylogenetic tree, or graph experimental results. All of these approaches count as drawing. Examples of different types of drawings you may make in this class. Indeed, in our class and in general, “drawings can vary to the degree in which they should be representational or abstract, depending on context. For example, a highly representational drawing of a wolf might be appropriate to a study of wolf behavior (where the stance and position of ears and tail is germane to the point), but a mere box with the word “wolf” might be appropriate in a food web or concept map” . Despite research demonstrating how effective drawing can be for learning and for assessment, a lot of people avoid this powerful visualization tool because they themselves don’t have drawing training. However, the good news is that “We’re not making great art; we’re using rough sketches to note important things about our specimens,” experiments, and observations . We can and will aim for sketching skills that are useful for our discipline. Happily, the way our minds learn to draw is similar to how we learn to speak . Further, by the time we are toddlers, most of us have the cognitive and motor skills necessary to use a pencil and make marks. It could be argued that humans are actually born knowing how to draw . And, as mentioned earlier, our collective ability to draw goes back even further, to prehistoric records made deep in caves. Better yet, drawing as we know it today isn’t a magical gift. Three-dimensional drawing, for example, took about 400 years to develop , and it wasn’t fully understood until the Italian Renaissance. Modern drawing basics are learned, not inherited. Fundamental skills, techniques, and knowledge of different media (ex: watercolors, pencils, pen and ink) can be taught, practiced, and improved upon. Thanks to a combination of your childhood aptitude and learning basic drawing techniques, anyone can learn to make sketches that are useful in learning and doing science. This is why our coursework will include training in basic drawing skills and an expectation that you will draw in every class. You will receive feedback on the content and accuracy of your sketches, not the artistry of them, through exercises, including those spanning the spectrum shown below. While repeatedly drawing from observations can help your drawing abilities improve in an aesthetic sense, our emphasis will be on using drawing as a tool and a learning process. For example, in the images below, the skull and feather may be visually appealing, but they aren’t very useful for learning, studying, or demonstrating knowledge. On the other hand, the second image is a set of field sketches of birds the sketcher found difficult to identify. While quick and rough, these sketches recorded lots of fairly detailed information, both in the line work and the accompanying notes. The information was sufficient to look up and correctly identify the species later. That’s when the sketcher added in the name of the species and some additional notes for future reference. Together, we’ll use drawing both to learn course content and to practice scientific thinking. By sketching, and then assessing and revising drawings in this way, we will together develop a skill set that has been central to the doing and discoveries of science for centuries . And just like drawing isn’t exclusive to artists, neither is innovation exclusive to established scientists. For example, a Hollywood actress during WWII invented a wireless communication system that underpins all our modern wireless technology . She did it by paying attention, asking questions, and connecting ideas that others around her took for granted. “The ability to notice, question, and direct our thought processes” is called metacognition. Metagognitive thinking is essential to innovation, invention, and discovery. And, a wealth of research indicates drawing can help us think in this way , . Indeed, “training the brain to draw, to engage with eye and hand, is to learn to be open to surprise, to perceive underlying structures and make unexpected connections and discoveries. In moving beyond automatic, superficial, and stereotyped responses and developing metacognitive skills like constructive perception, it is possible for those who draw to become deeper and more creative thinkers who are better equipped to solve problems across disciplines and make the leaps forward that advance all of us”. In addition to the introductory note above, you and your students may find it useful to read the following recommended articles. In particular, you may all be engaged, inspired, and informed by Field Notes on Science and Science. The book is a collection of essays about keeping notes from scientists working in a range of disciplines from anthropology and geology to comparative anatomy. There is also a chapter by a scientific illustrator who provides numerous accessible and useful drawing tips. Drawn to Science: Exploring the Historical and Contemporary Synergies between Drawing, Creativity, and Science: a 1-hour video recording of an invited seminar I gave to the University of Wyoming’s Zoo/Phys department in 2016. Are we hardwired to doodle? *Dr. Stephen B. Heard, from the comments below. This post has been revised to reflect the suggestions he made. Great resource here, Bethann! Thanks for posting! I think the argument here is fundamentally right: making a drawing is far superior as a learning tool to taking a picture, the same way that taking notes by hand is far superior to taking a picture of the chalkboard. But I want to sound a note of realism/caution. I’m one of those people who says “I can’t draw”. And I know that that isn’t quite true, and that I can learn (some) drawing skills. The problem is, for many years my mother and various teachers would say to me “Anybody can draw”. And what I heard was “It’s YOUR fault that your drawings aren’t good, because you can’t be bothered to try hard enough”. I was trying, and my drawings still weren’t good, and hearing this shut me right down. Some drawing skills can be learned, sure; but people differ in innate ability and preferred style, too. And people who can draw easily very often seem disrespectful of those who can’t, precisely and perhaps ironically because they seem to think it should be just as easy for everyone. So in a syllabus, I think one needs to be very clear about this. Rather than saying “Think you can’t draw? You’re wrong; of course you can”, I think we should say “Think you can’t draw? Guess what? It doesn’t matter. We’re not making great art; we’re using rough sketches to note important things about our specimens”. But then we have to follow up on this by grading fairly and transparently – a beautifully executed drawing and a hideous piece of junk should get exactly the same grade, as long as they show the same critical feature of the specimen (for example). In my experience, though, this is NOT how grading of drawn material often works. I think it’s a major readjustment for us to decouple the information content of a drawing from its artistic quality or precise representation, but it’s a readjustment we have to make when we require drawn material for credit. It does help a lot to realize that non-representational or highly abstracted sketches are ALSO “drawing”! I would play that up even more. 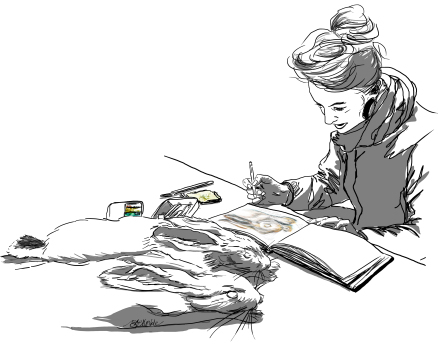 I was and still am terrified if asked to draw a rabbit, but have no problem sketching a phylogenetic tree or the expected shape of a relationship on a graph. I realize that pretty much all of this is in your piece! And yet reading I still felt taken back to my bad experiences; in particular, I think, the heading “Think you can’t draw? Think again!” set off every bad reaction I’ve ever had. It’s not inaccurate; it just plays into the bad experiences people like me have had with instructors for whom drawing came easily and just couldn’t wrap their heads around people for whom it didn’t. And again: I don’t mean to criticize the intent of the piece, which I absolutely agree with! It’s just that getting the message convincingly to people like me is harder than one might think. Stephen, THANK YOU for your comment. The rhetoric of how this is framed is critical, as you point out. I’ve revised the text above to reflect your suggestions. As for the equitable grading issue, I totally agree with you. That is essential, though often pretty difficult for instructors to pull off. I’m hoping, in working with this lab coordinator (and with feedback from folks like you), to draft a basic rubric template that will address this matter head on. If you have suggestions for the type of criteria that would be essential in a drawing in your specialty, for example, those would be really helpful. Similarly, I’m looking for comparative examples wherein the “less pretty” drawing is actually more accurate. I’d like to pull together enough of those (plus criteria) to develop this rubric into something that’s at least a functional foundation for a range of biology specialties. Your comment motivates me to get to work on it pronto. Also, note that there is a valuable (and brief) discussion of this matter – equitable commenting/grading that doesn’t privilege “pretty” drawings – in the California Native Plant Society field journal curriculum. I’ve linked to that in the recommended readings for instructors (it’s the last entry in that list). It’s a free curriculum, designed for middle-school instructors, but the tips and ideas are valuable for any age group. Here’s the direct link to download the curriculum: http://www.cnps.org/cnps/education/curriculum/index.php.